If you haven't baked bread before, now is the time to dive in -- because time is probably what you have. If you want an easy recipe, try the no-knead bread below. Mix your dough, let it rise for 12-18 hours, then bake it. If you can make scrambled eggs, you can make this bread. Once done, post your pictures to this Flickr group and I'll pick a winning bread. 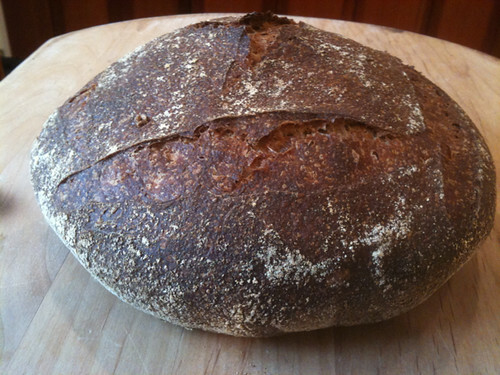 The prize: Jim Lahey's recently published book, My Bread (donated by his publisher). His no-knead recipe is the perfect starting point for beginning bakers. Open to new or beginning bakers. No ringers who have been baking bread for years. Baking must occur while you are snowed in. Once the streets are clear and life is back to normal the contest is over (which I assume will be Tuesday after the holiday weekend). Submit a picture to the flickr group to enter the contest and make sure I can contact you. I'll pick the winning photo based on what the bread looks like. Any comments on the bread and process will be welcome. 4.5 to 5.5 quart pot to cook the bread. A dutch oven or even a pasta pot will work. 3 cups (400 grams) white flour. Preferably bread flour, but all purpose flour will do. Avoid cake flour. Note: I updated the recipe slightly with new instructions in italics. Stir together the flour, yeast and salt. Add the water and using a spoon or your hands, mix until you have a wet, sticky, mass -- about 30 seconds. If using your hands, rub a little olive oil on your fingers and palms to keep from sticking to the dough. It should be sticky to touch, if not, add a couple of tablespoons more water. Cover bowl with plastic wrap, or a plate (I use a plastic tray) and let sit for 12-18 hours. If your kitchen is cold, put it on a high shelf in a cupboard. The surface will be dotted with bubbles and it will have doubled in size. When the fermentation is complete, generously dusting the counter with flour (I previously said rub olive oil on counter but using flour might be easier because this dough is so wet). Use a scraper or spoon to move the dough onto the counter in one piece so the bottom of the dough in the bowl is now the top. Though sticky, do not add any more flour. Rub your hands with more olive oil. Slip your hand under the edge of the dough and then fold the edges toward the center to make a round shape. It won't be like a ball because this dough is loose and wet. It will have a flat shape, and don't worry if it's uneven. Place a cotton or linen towel on the counter and generously dust it with wheat bran, cornmeal, or flour. Gently lift the dough and flip it over so that the folds or seams are face down on the the towel. Dust the top of the dough with more flour, bran or cornmeal. Fold the towel loosely over the dough and let sit for 1-2 hours. The dough's ready if you gently press your finger in the dough 1/4 inch and the dough keeps the impression rather than springing back. One-half hour before the end of the second rise, preheat the oven to 475 F. On a rack in the lower third of the oven, place your 4.5-5.5 quart heavy lidded pot. When ready to bake, using pot holders carefully remove the pot. Take off the lid. Unfold the tea towel, dust the loaf with more flour or bran and quickly invert it and place it the pot (the seam side is now face up). Be careful -- the pot is HOT. Don't worry if it looks uneven. Put the lid on the pot, jiggle back and forth and place back in the oven. Bake for 30 minutes, then remove the top. Bake for another 15-30 minutes until the top is a dark chestnut color. When done, use a spatula or spoon to remove it to a cooling rack. Wait at least 1 hour before cutting into it. The bread will continue to cook during this time and if you cut into it too early, the crumb will be gummy. Post questions in the comment section and pictures to the flickr group. Happy baking!